The ingredients are super simple and fairly quick to pull together. 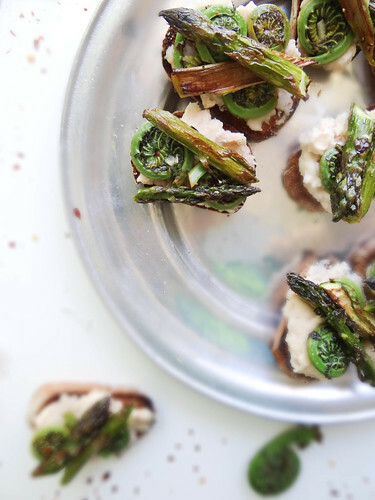 The only ingredient that may be hard to come by are the fiddle heads- if you cannot find them in your region simply sub in extra asparagus or fava beans - any spring/early summer veggie would work, adjust to your liking. Same goes for the heat, I like mine on the spicier side- simply cut down on the red pepper if you think it may be to hot for your taste. 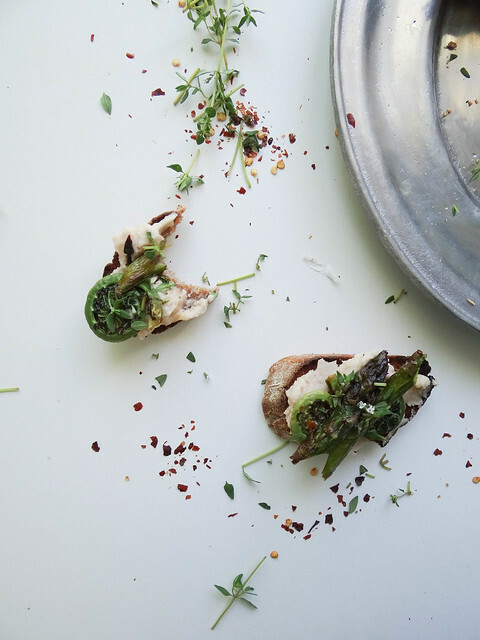 These little crostini's do have some kick to them, but in a good way. 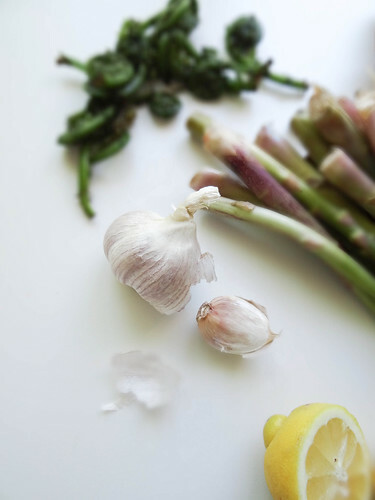 Fresh thyme, lemon and a little sprinkling of sea salt allow the flavors to stand out and meld with one another. My garden is in full swing, fresh herbs are so easy to grow in the garden, they are very forgiving and produce from spring all the way into the fall. There is nothing better than heading out back, just steps away from your kitchen to pick a bunch of fresh herbs or veggies for dinner. 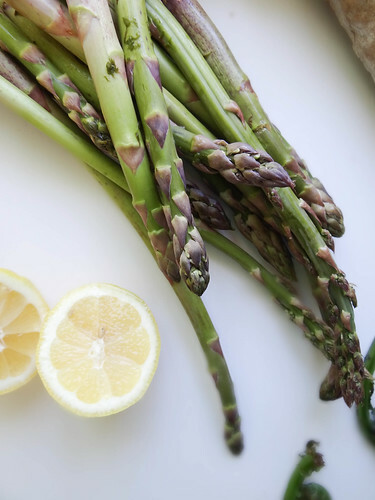 Asparagus is a bit more finicky, it takes about 3 years to establish itself before giving a harvest- once it is established it endlessly gives for many years. Next year will be my first asparagus harvest and I couldn't be more excited. Fortunately for me, Justin would not touch this with a 10' pole. 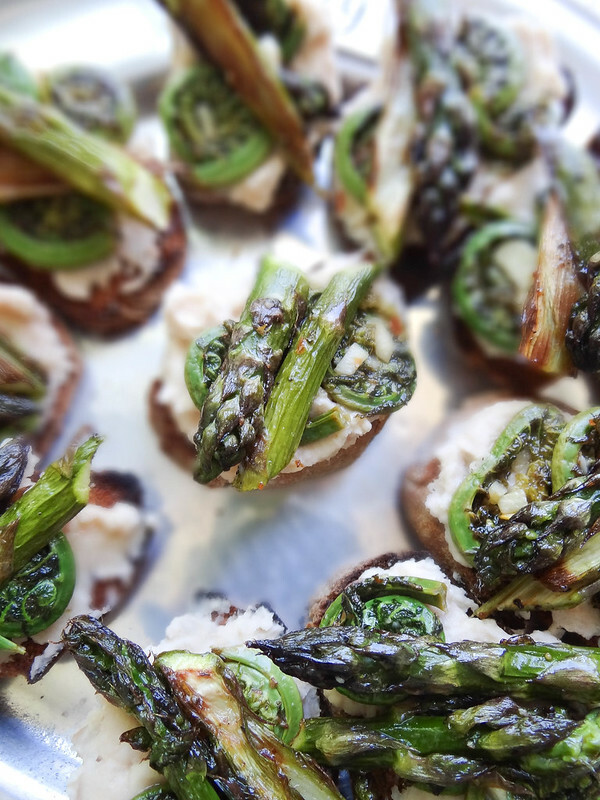 He is funny about asparagus and fiddle heads. However, a dinner out with friends last Friday may have changed his mind about asparagus - he tried a tempura fried asparagus and liked it- there is hope! His first words "its not bitter! ", I have no clue why he had it in his head asparagus was bitter- far from it. Still, there is just way too much going on with these crostini for Justin to try them the first time around- maybe after the 3rd or 4th attempt he will brave the crostini waters. Do you have a garden or participate in a community garden? Would you consider yourself to have a green thumb or do you leave the growing up to your local farmers? 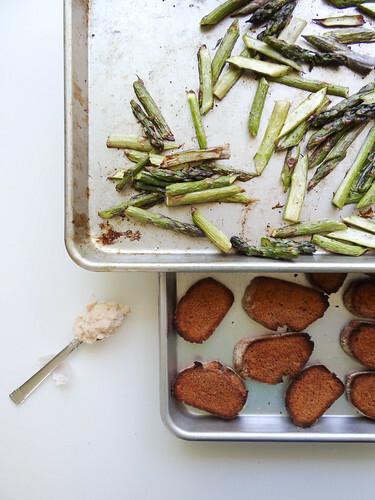 The white bean spread makes more than what the recipe calls for, it is an amazing spread for sandwiches and veggie burgers- stay tuned for a grilled sammie recipe later this week! Trim the bottoms of the asparagus and cut each stalk into 1" pieces - cutting the thicker stalks in have then 1" piece. 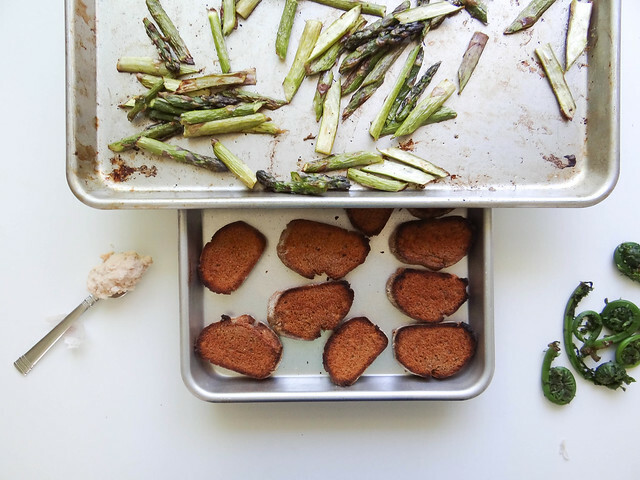 Spread Asparagus on a rimmed sheet pan and toss with olive oil. Roast in a pre heated oven for 10-15 minutes, checking and tossing the asparagus about half way through. Roast until soft and somewhat crispy/golden. Remove from oven and toss generously with salt & pepper, adjust seasoning to your taste. 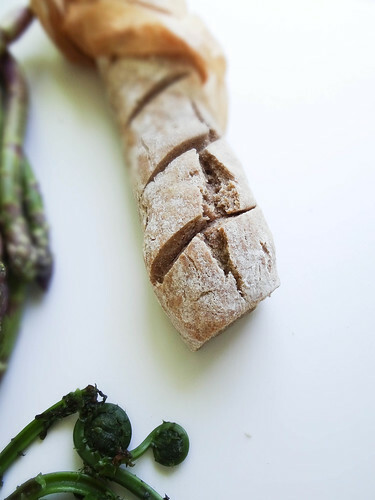 Slice the baguette into (20) 1/2" rounds - place on a rimmed sheet pan, spray with olive oil or coconut oil. Place pan under broiler and broiler on high for 1-2 minutes until rounds are golden brown- do not leave unattended, check frequently. Remove from oven and set aside. In a food processor, place the beans & lemon- process for 1 minute. While the processor is running slowly add the olive oil process until smooth & creamy (add more olive oil if needed). trim any brown spots from the fiddle heads, fill a large bowl with cold water and submerge fiddle heads, swirling the fiddle heads around a bit. allow fiddle heads to soak for about 10 minutes. in a medium sauce pan, bring 5 cups of water to a boil - add fiddle heads (carefully transferring from soaking bath to avoid stirring up the sentiment at the bottom of the bowl) boil for 5 minutes. while fiddle heads are boiling, rinse out the soaking bowl, fill with cold water and add 5 ice cubes. with a slotted spoon transfer the blanched fiddle heads to the ice water bathe. The fiddle head water in the sauce pan will be brownish black, discard water. In a medium saute pan over medium-high heat melt vegan butter and olive oil - add fiddle heads, garlic and crushed red pepper. saute for 3-5 minutes, testing taste and texture about halfway through cooking. at the half way point add fresh lemon juice. To assemble, set up all the parts in front of you within arms reach. 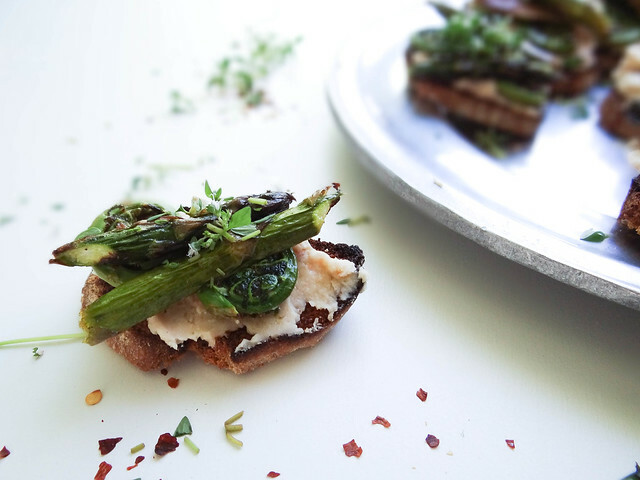 Spread about 1 tsp or so if the white bean spread on each crostini, top with 2-3 fiddle heads, 2 asparagus pieces. Sprinkle with fresh thyme & flaky salt. Enjoy at room temperature, can be assembled 1 day in advance. White bean spread will keep in the fridge for 1 week. This is such a fun snack. 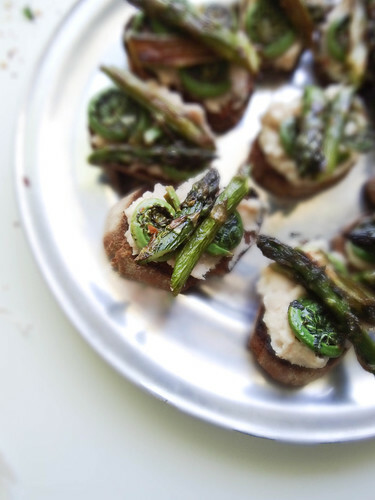 Fiddleheads juuuuust finished here in Montreal, but I bet something like this would be great with just asparagus too! 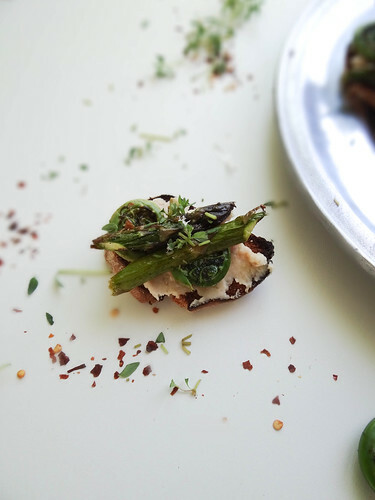 This would be such a beautiful appetizer at a BBQ or get together. The colors are so vibrant. 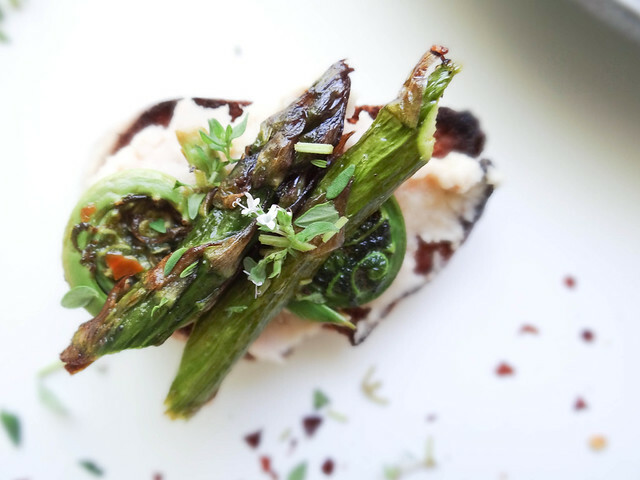 Like you, while asparagus is in season, I could eat it daily and would still be sad when the too-short season came to an end. I never used to be a fan of asparagus, but now I love it! And I have to be honest with you, I have yet to try fiddle heads... I've just never found them! As for the gardening, we always have tomatoes and pumpkins and rhubarb, and occasionally a couple other things (this year I have basil and thai basil), but I don't have the greenest of thumbs. My mother, on the other hand, does. She buys plants that are on mark-down price because they're in bad shape, and turns them around into the biggest, most bloomiest plants ever. I wish I had talent like that! 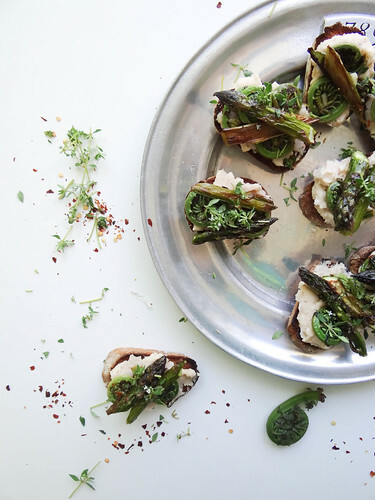 Oh, and duh - these crostini sound PERFECT. The heat sounds like just the right amount for me. If I were you I wouldn't encourage Justin to try them... more for you, heheh! I just made a bunch of crostini yesterday and wish I saw your recipe first! I'll have to bookmark it for my next crostini-making adventure. Sadly, I've actually never had fiddle heads. What do they taste like? When cooked right they are soft/creamy with a green earthy taste much like asparagus- if they are over cooked they can get mealy/grainy. They are a spring delicacy, if you are able to get a hold of them next spring you should definitely give them a go! I am blown away by the photography here girl! Just stunning! !